Nova Scotia Duck Tolling Retriever Temperament – Patience, Love and Intelligence What More Can You Ask For? The Nova Scotia Duck Tolling Retriever temperament is a winner. And the Toller as she is called is fantastic at retrieving. In fact, her name actually tells you this twice. In addition to being a “retriever,” the word “tolling” means she tricks waterfowl by playing with her toys by the shore, distracting them long enough for the hunter to shoot them. The Toller then retrieves the dead ducks and brings them back to her master. Despite sounding like a vicious hunter, the Toller is actually known to be smart, loving, and outgoing. When it comes to intelligence, the Toller has her retriever relatives beat. The Toller is, in fact, the smartest of all retriever breeds. She also loves to work. A hardworking Toller is a happy Toller. She also loves children and enjoys playing ball with them, or using her pulling skills to pull them around in their wagon. The Toller does well with other dogs, so long as she is socialized at an early age. However, if she gets a whiff of smaller “prey” that might be nearby, including cats and squirrels, she may pursue them. To best combat this, you need to keep her in a fenced-in yard, or on a leash when out for walks. Interestingly, the Toller's activity level doesn't rise to the level of her cousin, the Labrador Retriever. She is, however, a more active retriever than a Golden Retriever. She screams when she's excited or frustrated, and even the sight of a bird in flight can cause her to scream. This may mean she is not the ideal pet for individuals living in apartments or neighborhoods with a low noise tolerance. The scream is not, however, a sign that she's in danger or senses danger. The Toller is a hunter by nature, not a guard dog. 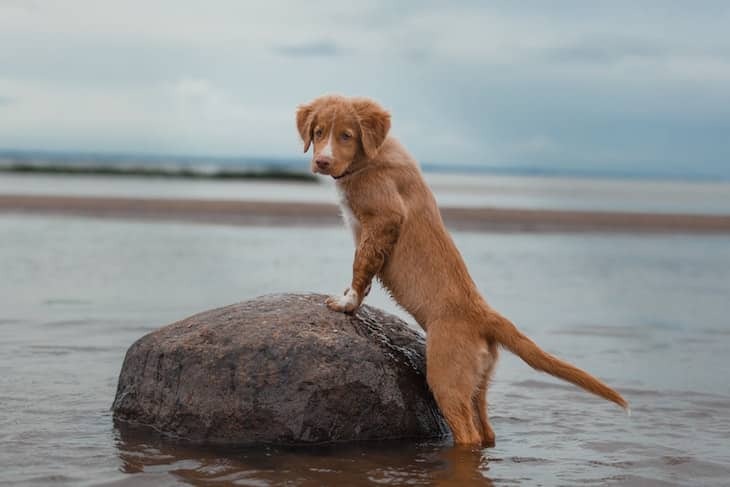 The Toller was born for the water – she actually has webbed feet! The Toller is very versatile – she can go from couch potato mode to hardworking gundog in mere seconds. 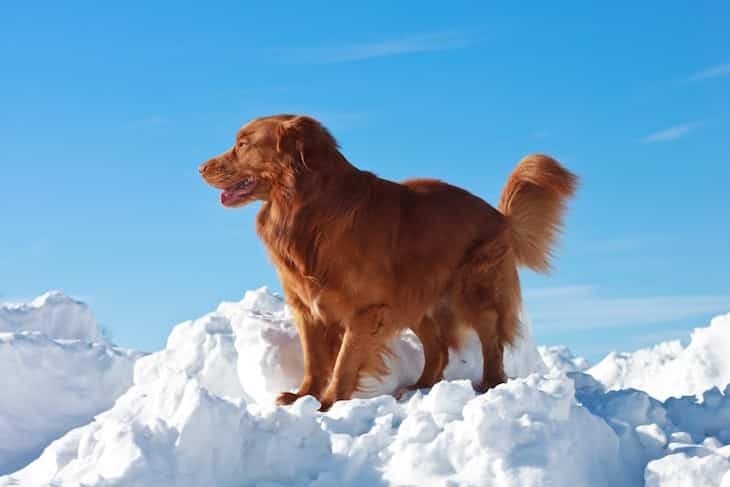 Her full name – Nova Scotia Duck Tolling Retriever – is actually the longest breed name on the American Kennel Club (AKC) breed list. A downside to the Nova Scotia Duck Tolling Retriever temperament is that she is not as eager to please her masters as, say, a Golden Retriever might be. This can prove difficult when trying to train her, as she can be very stubborn. If she isn't listening to the commands you're giving her, don't get discouraged. Remain firm, consistent, and persistent. Given the chance, she'll walk all over you. Don't let her. Most Tollers do better with training when rewards are involved, but be careful with the treats. You must monitor her weight to make sure she doesn't become overweight, which can happen quickly – especially with treats. 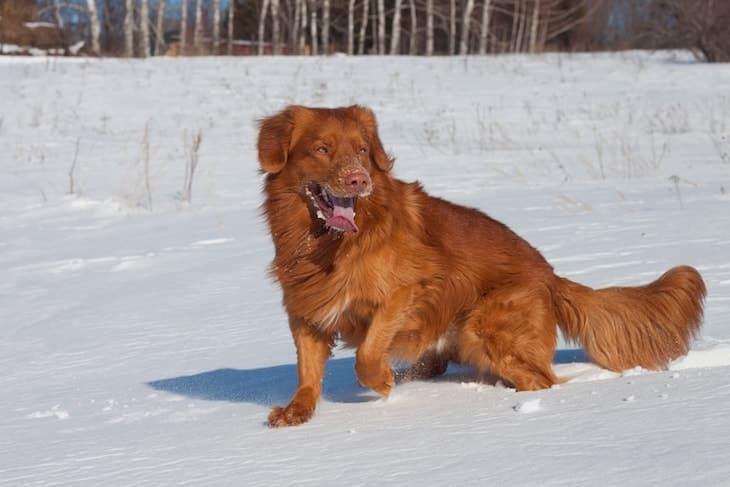 The Toller's fun-loving personality also means that she prefers training to be fun, too. Also, keep training sessions short. You're less likely to lose her attention that way. Grooming a Toller can be, in all honesty, a bit gross, depending on what she rolls around in. The dirtier and smellier, the better – the Toller has a blast rolling around in a puddle of mud. If she's not as dirty, then a weekly brushing should be enough, with more brushing during shedding seasons. Be sure to remove any excess hair that may grow between the pads of her feet to increase her traction on indoor floors. Most of the health problems that plague the Toller are related to their immune systems. Perhaps the most important health concern for the Toller is Addison's disease. Addison's disease is a condition that affects the glands, and it is 10 times more likely to be found in a Toller than in any other dog. Addison's disease may not be life-threatening, but it can be more severe for some dogs. If your dog suddenly becomes weak and experiences severe diarrhea and vomiting, call your vet immediately. The life expectancy for a healthy Toller is between 12 and 14 years. Finding the perfect Toller puppy may prove difficult. This is because this is one of those breeds that has been affected the most by inbreeding. Breeders are actively working to diversify the line better. If you find a Nova Scotia Duck Tolling Retriever for sale you must research your breeder very carefully before paying the high price. You may be surprised to learn that the Nova Scotia Duck Tolling Retriever price averages around $1,700 for a puppy. If you're looking for Toller puppies from a top-quality bloodline, then one of these puppies can run you anywhere from $2,200 to $4,800, and perhaps more. If you are interested in adopting a Toller, puppy or adult, the organization NSDTRC-USA specializes in rescuing and re-homing this lovely breed. As with any shelter, they provide photos of the dogs available for adoption, along with their estimated ages and a brief background of their histories. When in doubt, you can always go through the AKC. The AKC has a breeder finder on its website that can connect you to breeders that are registered with the AKC. A registered and licensed breeder is a breeder you can trust. And make sure you get copies of all promises the breeder makes to you in writing, as well as certifications of health clearances for the Toller puppy that you choose. The Toller is a friendly dog who is also very versatile. She's up for whatever you want to do, whether it's a nap or a hike. Her loud “scream,” however, does not make her an ideal choice for apartment living. She loves to roll around in the dirt and stinky things, which may make her harder to clean and groom. She may be a bit of a pain to train because she is stubborn and doesn't care quite as much about pleasing you. You'll have to make training short and fun and be firm and consistent with her, to keep her attention. Tollers are generally healthy, but it's important to be aware of health concerns considering their high level of inbreeding.